The International 2018 is over, and now the madness can begin. Which players will move? Which rosters will stay united? Keep up to date with all the moves and shakes with our Post-TI Roster Shuffle Megathread! So now that we made it through the open qual, I can officialy announce my new team for the season. Also interested in a coach. Secret.zai is back in action! The Southeast Asian offlaner who was involved in a dramatic kick at Fnatic last season is back. Marc Polo Luis 'Raven' Fausto will be playing by his side. We are proud to announce our lineup going into the new season of the Dota Pro Circuit. Please continue to support us and our players. Evil Geniuses registered themselves for the upcoming Major and Minor circuit with the exact same lineup they competed at The International 2018. After dropping Axel 'PABLO' Källman The Final Tribe added Rasmus 'Chessie' Blomdin to the roster. Adrian 'Era' Kryeziu will switch to position five. CIS organisation Vega Squadron * have announced sweeping changes to their roster. After the departures of Krivulya 'Cema' Semion and Evgeniy 'Blizzy' Ree, the org have also announced that they had parted ways with Dmitriy 'UnderShock' Bolshakov. In the offlane, the side have picked up Alexander 'Flow' Sazonov, who they say they have been tracking for a year, while Vladimir 'Yol' Basov assumes position 5 captain duties. Having initially tracked Idan 'MagicaL' Vardanian for the midlane role, the player chose to join Natus Vincere, so instead they have brought on board Kyrgyzstani player Duulat 'StormC4t' Subankulov. BoBoKa to a reformed Team DK? We would like to thank our 2017-18 dota roster for helping us enter the scene and for making an incredible run at TI. Due to new Valve rules around team ownership, the Forward Gaming roster that impressed at The International 2018 now find themselves org-less. However, that has not stopped Roman 'Resolut1on' Fominok from announcing that most of the side are staying together, with the exception of JingJun 'Sneyking' Wu. Instead, Fnatic offlaner Saahil 'Universe' Arora will join the side, who as yet have not found a new organisation to represent. We don't think they'll have to wait long, given they earned a lot of new fans with their performances in finishing top of Group B in Vancouver. Two major changes at NA org compLexity Gaming in the last couple days, as carry David 'Moo' Hull and support Adam Erwann 'Adam' Shah leave. The side competed at ESL One Katowice 2018, The Bucharest Major 2018 and EPICENTER XL, but missed out on qualification for The International 2018 in the North America Qualifier. Mars Media Director of Events & Business Developement GodBlessMali, formerly of LGD, revealed that the Chinese TI8 runners-up will not be changing their roster in the off-season. Since bringing in Chalice and xNova the side have experienced great success, and this will come as welcome news to fans as they look to build on that second place when the new DPC season begins. The European roster of Elements Pro Gaming have announced through captain Nikola 'LeBronDota' Popovic that they will be sticking with the same side going into the new season. The org recently placed second at the Rivalry.gg Rumble, and are past joinDOTA League competitors. All-Swedish roster The Final Tribe have revealed that support player Axel 'PABLO' Källman has been released from the side. Having come through qualifying, they finished 13th-16th at the China Dota 2 Supermajor, and are former joinDOTA League winners. After having been the subject of rumours on VPGAME, Chinese org Newbee have angrily refuted claims that the roster was about to disband. This has been backed up in a tweet by GodBlessMali, meaning the side that disappointed at TI8 will have the chance to start afresh in the new season. Malaysian midlaner Yeik Nai 'MidOne' Zheng needed just two words to confirm his intent for the new season, choosing to reveal all on Twitter. Secret did relatively well at The International 2018, finishing in 5th-6th place, and of course will be looking to do better in the new DPC season. So, this one's not strictly post-TI. 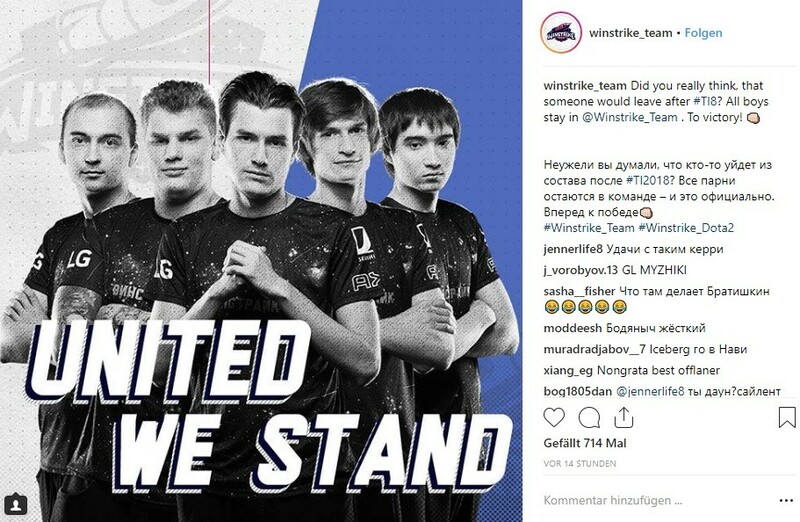 Fresh from a new partnership, Russian org Virtus.pro announced way before TI8 that they had secured their roster for the foreseeable future. The side finished top of the inaugural DPC standings, and despite later exiting TI8 prematurely, will be looking to carry that form into the new season. Their Major charge will begin by defending their title at ESL One Hamburg 2018, having been announced as the first invite.